Another quick Erica's Essentials for you, and this one works with any style you chose to decorate your home with - White Pottery! White pottery, (especially when its from Jonathan Adler) is an easy and affordable item to collect, and best when you have more! Even after losing a few precious items during the big move this summer, this is my collection that is sprinkled and peppered throughout the Love Loft! Candle and votive holders, bud and flower vases, make-up brush and cotton ball containers, keepsake jars, olive oil drizzlers, or just ornaments and decoration - white pottery is a great way to continue collecting pieces over time, that will end up working together by default! 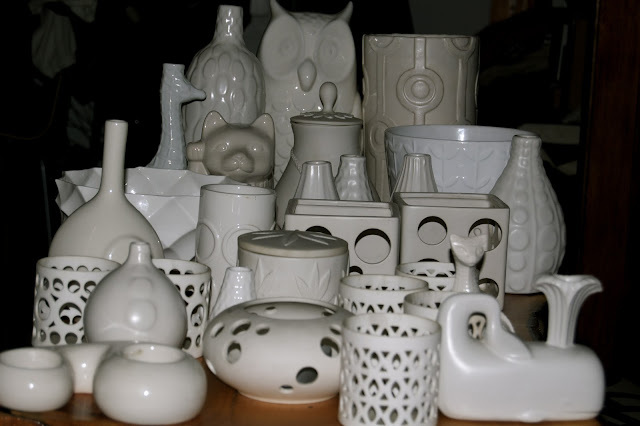 As the years go by, I add to my white pottery collection carefully, always picking up a piece at the Jonathan Adler Warehouse Sale, and on my travels. I always keep my eye open for something that would compliment the collection, but stand alone with its own story or memory.